1) Make the Dipping Sauce Mix all ingredients until sugar dissolves. 2) Make the Dumplings In a bowl, mix all ingredients except the wonton wrappers, corn starch, water, and oil. Arrange 3-4 wrappers on work surface; keep the other wrappers covered with damp paper towel. Brush edges of the wrappers with water and drop ~1 Tbs of the filling in the centers. Fold over one side of the wrapper to form a half moon, pressing the edges together. Transfer to a parchment lined baking sheet and cover with plastic wrap; assemble the remaining dumplings. 3) In a bowl, stir the cornstarch with the water to make slurry. 4) Heat 1 Tbs of the oil in 8-inch nonstick skillet. 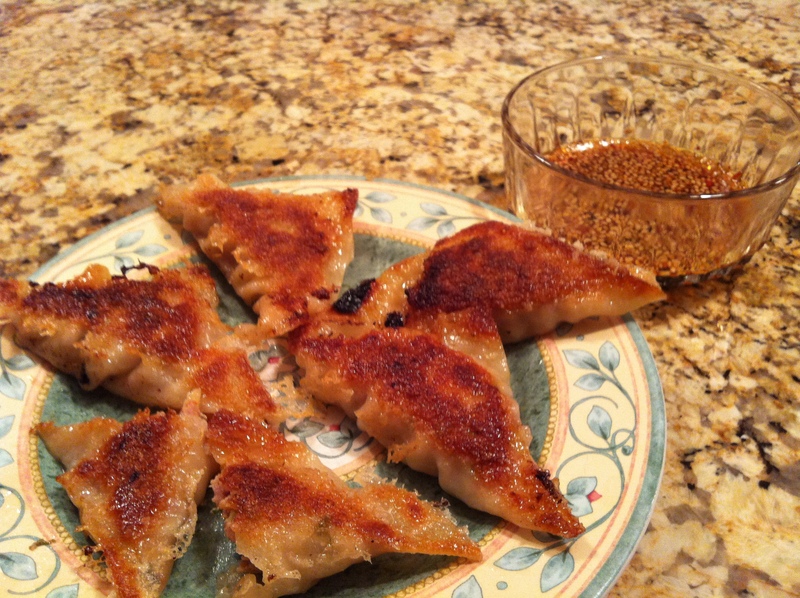 Arrange 10 dumplings around the edge of the skillet, overlapping slightly, there should be almost no empty space. Cook over moderate heat until golden on the bottom. Drizzle one-third of the slurry over and around the dumplings, cover the skillet and cook for 1 min. Uncover and cook until the dumplings are cooked through and the slurry forms a thin crust, ~4 mins. Carefully invert the dumpling pancake onto a plate. Repeat until all dumplings are cooked and serve with dipping sauce.